Butlers Buses! After an exhaustive search for the perfect bus company to contract with for Celtic Heart Tours, I settled on Butlers Buses out of Cork. Ready to roll — Ian and the tour bus. 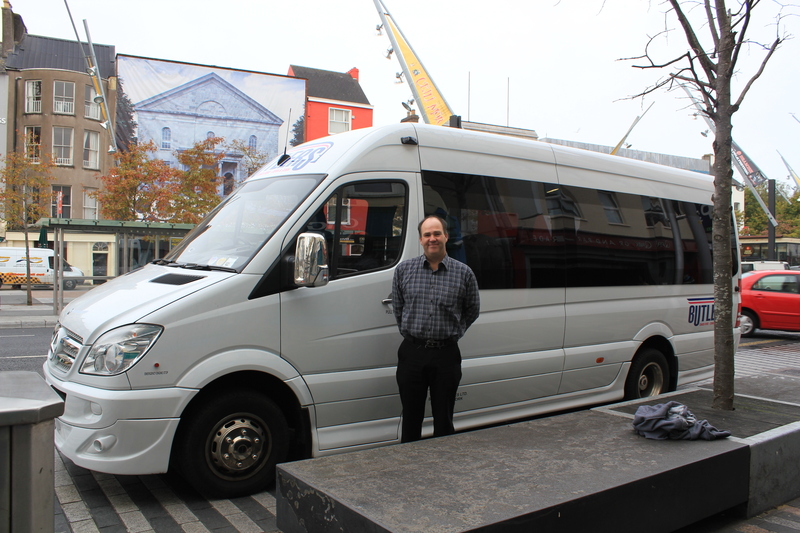 I met with four different bus company representatives, and while two others were strong contenders, Butlers stood out as the experts in the field of custom tours and drivers who were also knowledgeable and personable guides. Butlers representative, Ian, assured me that if their drivers didn’t have the personality for the job they didn’t last for another tour. I’ve found that Irish people in general, despite the many cruel blows fate deals them, are a talkative, jovial lot. Having a captive audience is perfect. Butlers also has a driver who is from the Beara Peninsula, so if the schedule works out right he will be our driver. That’s an added bonus! 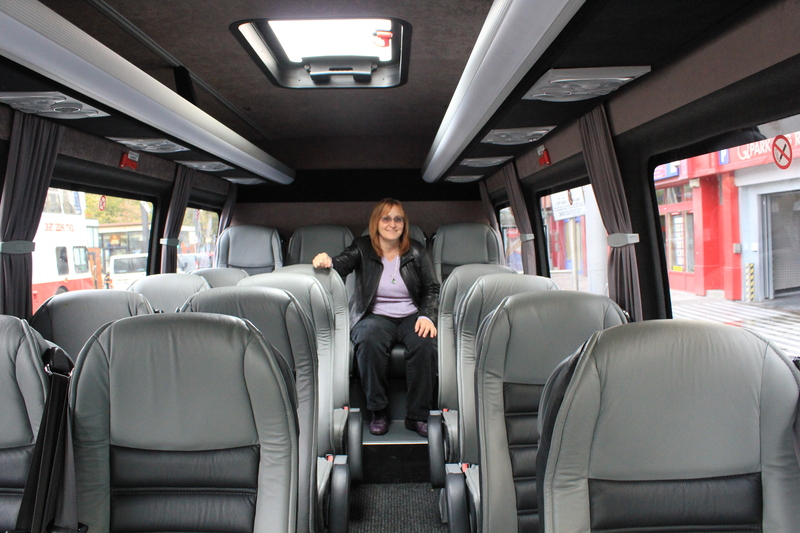 Wider leather seats, lots of leg room, large windows for everyone and plenty of extra room to move around. After sealing the deal with Ian I headed north, to Doolin and Galway. But first I had to get out of Cork. Pulling into a gas station on the incoming side of the street, I couldn’t pull back into the outgoing lane. No problem, I’ll just circle around the block. Five miles of back streets later I was finally able to rejoin the main highway and sped north as fast as I could. If I never drive in Cork again it will be too soon! It’s a lovely walking city. As I drove north a light rain began to fall, and as I neared Doolin, once a sleepy fishing village but now a major tourist destination because of its four pubs that play trad music nightly, it was a full on storm. Tourists huddled in Gore-Tex pushed into the headwind, making for the fabled Cliffs of Moher, which were shrouded in fog. Visibility was about 10 feet. Most people only come to Ireland once in their lives and they try to cram in as much sightseeing as possible. With the vacation clock ticking and a list of sights to see, they can’t take an extra day to see if the weather clears. It’s a shame, because the weather here is very changeable. It looks nicer today already. 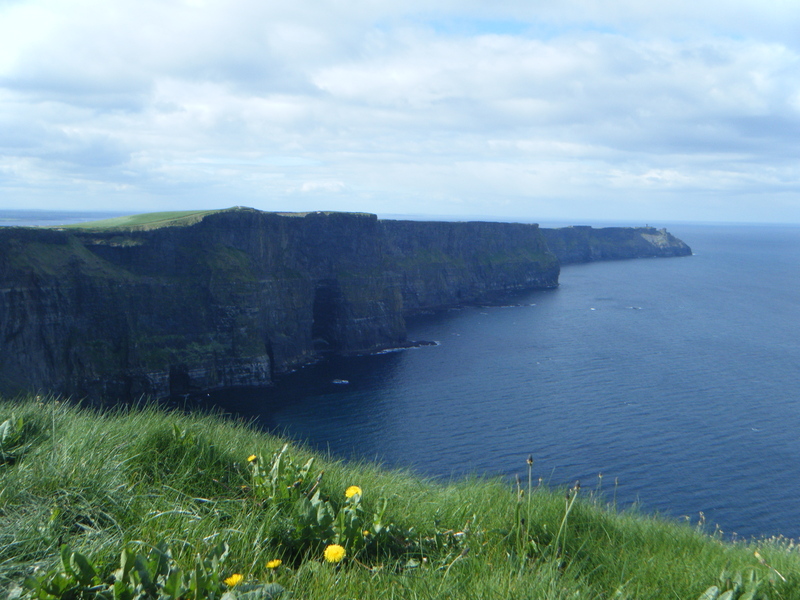 This is what the tourists didn't see yesterday: the Cliffs of Moher. Shot taken May 2010 by Chris Grant. I’ll be making my way leisurely to Galway today, just an hour’s drive up the road. On the way I’ll visit the starkly beautiful Burren, and maybe check in on an abandoned estate house I saw many years ago. And if the weather gets too bad, there’s always a warm pub to duck into. Is This the Way to Knocknagorraveela?